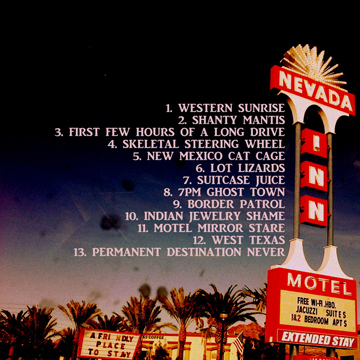 Birth by Joy Through Noise is today’s featured track from THE ENTERTAINMENT. Birth pummels and entices with its distorted beats and tweaked melodies. The thump of industry crawls out of the factory to embroider the earth. Below, see Joy Through Noise’s answers to our questions about the track, music-making, and her approach to sound. Stay tuned, all the contributors to THE ENTERTAINMENT will be featured here in the coming weeks. The track Birth came from a series of songs that I wrote all around the same period, late 2013-early 2014. I became really inspired by writing within the 180-190bpm spectrum and also began incorporating more drum and bass elements into my sound production. At that time I was performing much more consistently that I had in the past and that created this momentum and inspiration of writing new material which was more refined that anything I had done prior to that. The song Birth developed through my performances, after each set I would refine it a little more based on how well it took on a loud system and in a public space. Everything was written and performed in my Electribe EMX, no external processing or editing was done. I wrote Birth during a time period where I felt as if I was literally giving birth to myself, both a creative and destructive metaphysical process, so I was drawn to melodies and sounds that evoked a movement of primal emotions, a feeling of going deep within oneself. I don’t necessarily intend to create listener reactions, but I am conscious of invoking a mood. I certainly think I make more sense when I am creating, even if just to myself. I’m very non-linear, so when I am creating I am more aligned with my nature flow. But who I am as a sound artist evolves because of what I take from everyday life, the challenges of reality help me grow and also appreciate the moments when I am in my self-induced creative atmosphere. To me, noise is sound without boundaries, something shamanic/primal, frequency created outside the limitations of definition. Noise is part of my creative process, hence ‘joy through noise.’ In my music, noise functions as an energetic component, and often times it’s how I shape a sound in an unusual way so that it’s not just “music” in the traditional sense, but it’s something beyond sensual reality. I don’t really think about the ‘listener’ when I create. Especially since everyone experiences the world through there own perceptual filters, it wouldn’t even matter because people will have their own experience of it anyway. I create what comes through me and what I want to hear. 5) What’s next for Joy Through Noise? Anything you want to tell people about? I have a couple albums in the works, one of which will be a release of all the tracks I wrote along with Birth, and then another which is all new tracks that I’ve written on the Tempest. Simultaneously I am working on a few release for TWIN BRAIDS, which is my project with Baseck. I am performing in LA regularly with both music projects. Along with performing and recording, Baseck and I have a night we host called CELEBRATE EVERYTHING, which is dedicated to showcasing the most potent Experimental Electronic Music, so if your in LA you’ll definitely want to keep our events on your radar (http://www.celebrateeverything.la). Thank you, Joy Through Noise! We’ll see you at CELEBRATE EVERYTHING when we’re next in LA. Their Bellies Full of Sand by Speak Onion is today’s featured track from THE ENTERTAINMENT. Relentless and reckless, shot through post-industrial wreckage, Their Bellies Full of Sand is a fine introduction to Speak Onion’s oeuvre. Below, see Speak Onion’s answers to our questions about the track, music-making, and his approach to sound. Stay tuned, all the contributors to THE ENTERTAINMENT will be featured here in the coming weeks. The raw materials are pretty typical: cut-up breakbeat like thing, heavy kicks, modulated bass, feedbacky noise, dark melodic thing. The tempo is much lower than most of what I do, though. For a (brief) period during the development of this track I was wondering about whether I could make something more “dance-y” even something that a DJ could use in a club situation. I never dove all the way into that, but some of the patterns still bear that mark. I’m definitely better off in the creation of my music than I am in regular life: even when it’s frustrating it’s exciting; there’s (almost) nothing that’s completely out of my control; I eventually get somewhere good. Once the music is complete, though, I think it’s a much worse place than my regular life. It’s kind of a bummer, actually. No fun, no smiles. Noise is absence of order, and you can extend that to say it’s the absence of intention. I introduce a lot of literal noise into my music, and then spend time fighting that noise off to reassert intention/order. That’s one of my primary tension-building techniques. No. I want people to feel a very concrete connection to the music and feel they know it very intimately. Not on the first or even second listen, probably, but eventually. I want them to experience “Their Bellies Full of Sand” as a world they can inhabit directly. I want it to feel real for them. 5) What’s next for Speak Onion? Anything you want to tell people about? Come see me play a show in Brooklyn on March 20 at Coco66 for Barcore, and look out for a full length album coming this year. Thanks, Speak Onion. If you’re anywhere near N.Y.C. on the 20th, make sure to go see the show. Guaranteed to have more beats per minute than anywhere else in the world. True density, unbridled energy. No Room For Talent | A.I.M. Speak Onion teams up with redHat for THIRD RAIL / TERRITORIAL DISPUTE! 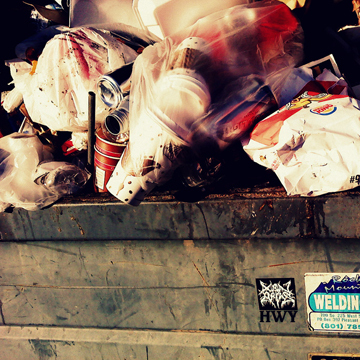 redHat and Speak Onion are two of the U.S. east coast’s pillars of hard electronic music, and they’ve teamed up here to create two pieces of breakcore-based industrial mania. “Third Rail” contains trace elements of both redHat and Speak Onion’s respective styles, but finds a previously uncharted place where mutated bass is the basis of all existence and breakbeats are unmercifully chopped, crushed, and reconstituted. With “Territorial Dispute” the pair push further out into dark space, grappling with divergent anomalies until a polystylistic embryo splits and spatters its juice over the void. An essay by Immigrant Breast Nest’s David B. Applegate is up now at the arts and writing blog Montevidayo. Check it out for an exploration of performance practice and electronic music, a peek behind the curtain into the process of one of I.B.N.’s founding artists. Immigrant Breast Nest is proud to release the latest beat collection from Xrin Arms. The aptly titled “HWY” evokes a hip-hop inflected road trip through the American Southwest, a Spaghetti Western where the spaghetti has been laced with cough syrup. This is music that puts you in a trance and wakes you up in a different time zone; another successful fusion from Xrin Arms, a true master of left field sonics. Thermometerometer returns! “Traumameter” available for download now! 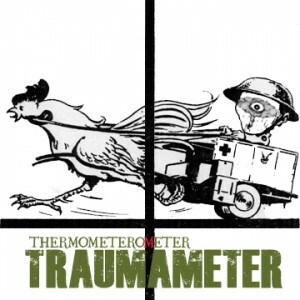 Thermometerometer returns with “Traumameter,” a thorough exploration of the borderland between electronic wreckage and bass. The duo of David B. Applegate and Speak Onion’s Dan Abatemarco started Thermometerometer to measure the measurers and succeeded in obliterating all yard-sticks. Now, they’re left with no other option but to measure the damage. These tracks are guaranteed to blow up your cabbage and cut your meat into ribbons. We’ll send an ambulance. 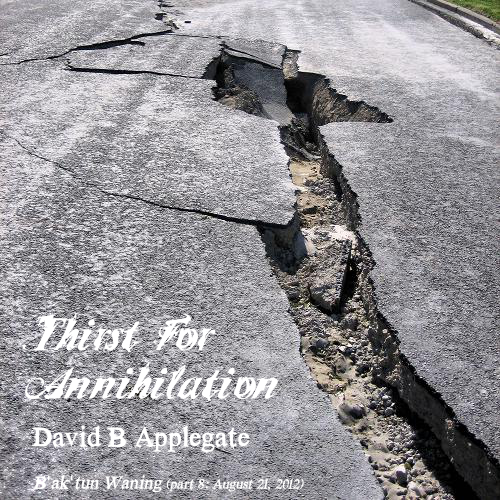 Hot on the heels of his June release A bit obliterated comes this new banger from David B. Applegate. Thirst for annihilation weds an insistent beat to an army of disembodied sounds bent on ushering in the end times. If you even try to sleep on this, it’ll start in again with the voices and keep you up all night, get it! Apocalypse? What apocalypse? 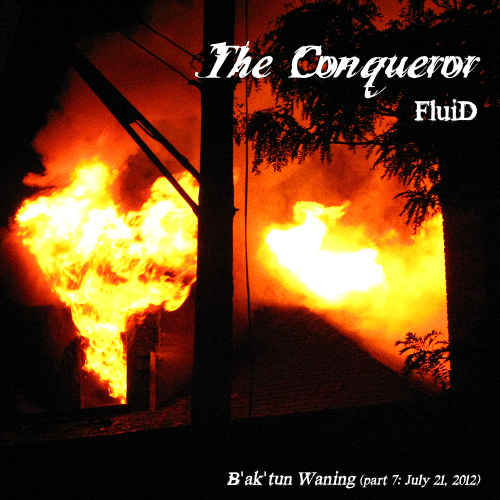 Take a break from eschatological anxiety with this month’s B’ak’tun Waning track, “The Conqueror” by FluiD. 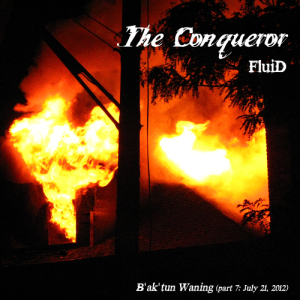 Turn this one up and let FluiD‘s hip-hop inflected electronics massage your panic into a party.